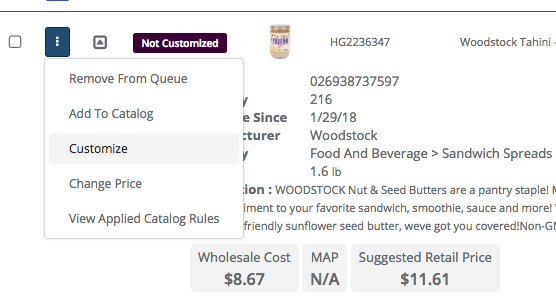 Rename, modify, and combine your supplier's feed categories into your own custom store categories. If my feed is already active and I rename a category, when will it update? After you have set your feed to active and your first initial upload has run, any category name that was loaded at that time will not be overwritten with any changes you have made. This obviously does not apply to any categories that did not upload to your store in the first upload (because no products were set to load from that category). Basically the rule of thumb is that if you have loaded a category to your store once, no changes in the category mapping tool will overwrite that initial upload on the next syncs. You can perform a "Full Upload" within your Catalog Rules > Controls > Next Sync Update Type, which we will overwrite all product data for all products including category names. I've renamed and customized my categories, why do my products say "not customized"? 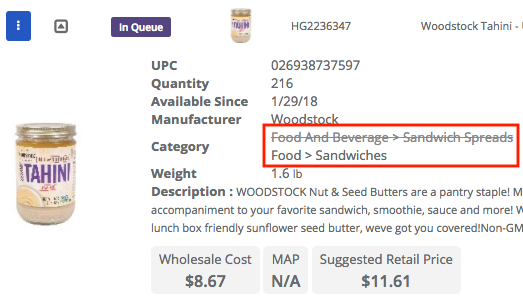 The "customized" and "not customized" labels are used to denote when you have changed a title, image, description, and other data found when clicking on a individual product and selecting "customize". To confirm if a category for a product has been updated you can click on it to see the custom categories (as seen below).